Here’s a complete toll free area codes list and exchanges. 1. What are the current available toll free number area codes? The following toll free area codes are available: 833, 844, 855, 866, 877, 888 and the classic most recognized toll free number area code of all: 800. The FCC has recently released the newest toll free area code 833 and it’s now a great time to get an 833 vanity number. This is an important announcement because your best chance of getting a toll free vanity number is within the first few weeks and months of a new toll free area code release. The good ones get snapped up quick. 2. What is the difference between a toll free code, exchange or prefix? For all intents and purposes, there the same thing. They usually refer to the first 3 digits of a toll free number however this is not technically accurate. Technically the first 3 digits of a North American phone number is called the NPA code or more commonly called the Area Code. The next 3 digits of the number are technically called the NXX Exchange or Prefix. However, more often than not toll free service providers often refer to a toll free area codes as a toll free prefixes. 3. Who decides when a new toll free area is released? FCC in conjunction with the National Toll Free Registry, Somos, determine when new toll free number area codes are released. These releases are based on demand (small businesses purchasing and using toll free numbers). When there is a shortage of toll free numbers available in the spare pool Somos request the FCC approve the release of a new batch of numbers with the next available toll free area code. Historically, new toll free area codes are released every 3-5 years. 4. What happens when all toll free prefixes are used up? We hope this day never comes and thankfully the FCC has taken steps to ensure it won’t happen any time soon. In fact, the FCC has reserved area codes outside of the traditional 800 number serious just in case we run out. 5. When will the FCC release the toll free area code 833? It’s scheduled to be released on April 22, 2017 (however release dates often change). The most recent toll free number area codes to be released were the 844 area code in 2013 and the 855 area code in 2010. 6. When will the 822 area code become available? There has been no date set for the release of 822 toll free numbers. However, historically new toll free area codes are released every 3-5 years, therefore it’s reasonable to estimate the earliest release date for 822 toll free numbers would be 2020. 7. Is 811 a toll free number area code? The area code 811 has not been reserved to be used as a toll free number. Certain regions in North America use 811 numbers as a governmental info lines similar to 411, therefore the FCC has taken it out of the toll free rotation. 8. What area code comes after 822? After 822 toll free numbers are used up, the next set of prefixes reserved are 887, 886, 885, 884, 883, and 881. 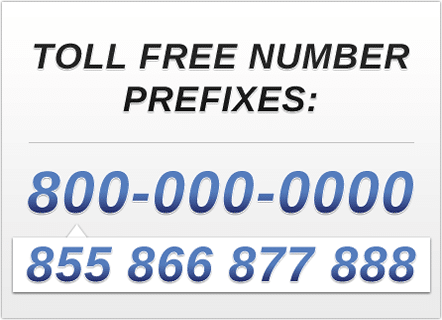 Technically those are area codes but again, when it comes to toll free numbers they are also referred to as prefixes. 9. Can you pre-order and reserve a toll free are before it is released? Yes, shortly before a toll free area code is released some phone companies or toll free number brokers may allow you to submit pre-order requests, giving you the best chance to be first in line to secure a great vanity number. New toll free phone numbers are distributed to RespOrgs (phone companies with special authorization like AT&T and UniTel Voice) in batches of 100 numbers per day on a first come, first serve bases before they become generally available to the public. 10. Can you still get a number with an 800 area code? Yes, UniTel Voice has a selection of great 800 numbers for sale and available for instant signup. However, because 800 numbers have been in circulation longer than other toll free area codes like 888, 877, 866, 855, 844, and 833 – there aren’t as many available. When Will 833 Toll Free Numbers Be Available? Yes, 877 Numbers are Toll Free Numbers. Here’s What You Need to Know. Are 888 Numbers Toll Free?